Palmiers, aka elephant ears, are beautiful nibbles you can serve with wine and cocktails before dinner or as part of a larger party menu. They look impressive but are very easy to put together, particularly because puff pastry overcomes most visible flaws when it cooks and puffs. You simply layer fillings on top of a sheet of thawed puff pastry, roll each long side half way to the middle of the pastry, slice, and bake. Most of the palmier recipes I’ve made can be prepped a few days in advance and frozen until you’re ready to slice and bake, and you can serve them warm out of the oven or at room temperature, making them a strong candidate in the race for perfect party food. For this recipe I made a green chile pesto and paired it with creamy Monterey Jack cheese and aged manchgo, a firm cheese similar to parmesan in texture, and Serrano ham, which is essentially the Spanish version of prosciutto. The result is lovely blending of flavors with the green chilies proving a subtle heat and chile undertone that’s nicely balanced by the creamy cheese and the salt of the ham. Unlike my Green Chile Macaroni & Cheese recipe, these palmiers won’t beat you over the head with their green chile flavor, making them perfect for those who are new to green chile. Green chile aficionados will still appreciate the familiar flavor and may be pleasantly surprised to find green chilies used in this way. Puff pastry is one of my entertaining secret weapons. It’s versatile, easy to work with, and impressive. For many years puff pastry was a bakery specialty because there weren’t very many good pre-made options. Today however, several food companies have perfectly acceptable packaged puff pastry offerings that you can find in the freezer section at your local grocery store. I typically use Pepperidge Farm because it’s consistent from package to package. Combine the cheeses, cumin, coriander, oregano, and salt in a medium bowl and toss to combine well. Lay the puff pastry sheet on a lightly floured surface and roll it out to a 9 x 10.5 inch rectangle. 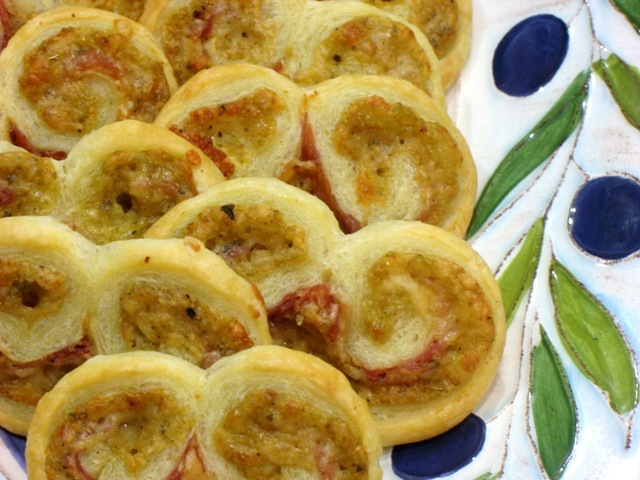 Spread the green chile pesto evenly over the puff pastry leaving a border of about ¼ inch on all sides. Sprinkle the cheese and spice mixture evenly over the pesto. Lay the slices of ham over the cheese, cutting them as needed to cover the cheese mixture evenly. Starting with one long side, roll the pastry over the filling into a tight spiral, stopping when you reach the mid-point of the pastry. Roll the other side of pastry over the filling until it meets the first roll. Using wet fingertips or a wet pastry brush, brush the pastry where the two rolls meet lightly with water and press them lightly together to seal. Gently transfer the rolled pastry to a cookie sheet and freeze for at least 30 minutes until firm and easy to slice. Cut the rolled pastry into ¼ inch slices and place an inch apart on a lightly greased cookie sheet. Gently shape each slice to make any square corners rounder. Transfer to the hot oven and cook for 13-15 minutes until the pastry is puffed and the cheese melted. Remove from oven, transfer to a serving dish, and serve warm or at room temperature. You can prepare the recipe through step nine up to three days in advance and freeze the rolled and filled puff pastry wrapped tightly in a double-layer of plastic wrap. When you’re ready to slice and bake the palmiers, set the frozen pastry on the counter for about 15 minutes and then proceed with the rest of the recipe. You can easily double this recipe to use both sheets of puff pastry that typically come in a package. If you can’t find Serrano ham, you can substitute prosciutto or any other thinly sliced dried ham. If you can’t fine manchego cheese, any other firm Spanish cheese or even parmesan will do in a pinch. Don’t worry if the uncooked palmiers look like scrunchy faces instead of smoothly curved pastry. When the pastry cooks, it will flesh out and become nicely rounded. Combine the pine nuts and garlic in the bowl of a food processor and process for 10-20 seconds or until the garlic is chopped into small pieces. Add the green chiles and manchego to the bowl of the processor and process with on/off turns until the mixture forms a paste. With the processor running, gently stream the grapeseed oil into the bowl. Scrape the pesto into a small bowl then stir in the salt and pepper. Taste for seasoning and add more salt and pepper if needed. This pesto resembles hummus more than it does traditional pesto because the pine nuts and manchego cheese tone down the green in the cheese. Once you taste it, you’ll know it’s absolutely not hummus. This pesto is a nice alternative to using green chilies on their own because it brings a more subtle green chile taste to a dish where you don’t want to the chilies to overpower the other ingredients. You can substitute canola oil or any other flavorless vegetable oil for the grapeseed oil. Store the pesto for 3-5 days in the refrigerator covered with plastic wrap. You can serve this pesto as a dip with tortilla or pita chips, tossed with pasta and some additional cheese and cherry tomatoes, or even in a quesadilla. You could also serve it over (or under) grilled chicken or roast pork. Let your imagination go wild. Is everything this month going to be green chile? I love it! This recipe looks delicious! I couldn’t have guessed palmiers would be so easy to make. Thanks for the tips! What a great recipe and I definitely love that these are easy to make but yet seem so fancy schmancy! You are reminding me to ask my mom for her recipe for cheese twists that starts with a ready-made filo dough base and are so fun to make and eat! Just grabbed this recipe and planning to make it for a get together next weekend! Can’t wait.